My good friend Christine emailed me asking for assistance so her adopted son Rainstar (Dominica’s first Kalinago Indian pilot) could manifest his desire to become the first commercial airline pilot. At 27, Rainstar has already made history. When he was only 16 years old, he was featured in the documentary film Celebration of Flight, where he partnered to build an airplane from scratch with the 78 year old retired Swedish pilot, Daniel Rundstroem. Please take the time to hear his story and if you like what you are hearing, put your money where his heart is and Go Fund Rainstar. Below is a re-post from The Dominican.net. Rainstar Luke at the controls. Salybia, Dominica (TDN) — Dominica’s first Kalinago to become a pilot is well on his way to earning his wings as a commercial airline pilot. For Rainstar Luke it has been and continues to be a long and determined struggle but the proverbial light at the tunnel’s end is already in sight. Rainstar was born in Salybia, part of the Kalinago Territory on the South West coast of Dominica comprising a 3 000 acre swathe of land set aside for the Caribbean’s last remaining indigenous people. As a child he was adopted into the loving family of Matthew and Christine Luke. Growing up on the family owned oyster mushroom farm, one of only a handful in the Caribbean helped Rainstar develop a very strong work ethic. It was there during his formative years that he developed a keen interest and fascination with airplanes. “As a child everyone bought me model and toy airplanes, which helped develop my interest in aviation”, Rainstar fondly recalls. “I was very fortunate to be always in the right place and time to meet and network with persons who shared my passion for escaping the bonds of mother earth,” he notes. Rainstar’s first opportunity to sit in the cockpit and feel the controls of an aircraft came at a very young age. Family friends Mark Ellison and Cheryl McPherron who flew frequently between Dominica and Florida in their twin engine Cessna 421 made that possible. They also provided him with books and aviation magazines and shared their knowledge of airplanes. “I fell in love with flying and awaited every opportunity to be in the cockpit. Flying brings me a sense of peace by focusing on the task at hand, being situational aware,” Rainstar stated. Before pursuing his lifelong love of flying, Rainstar would make aviation history in Dominica. He partnered with Daniel Rundstroem, aged 78 a retired Swedish airline pilot residing in Cochrane and who owned a Thorpe 2 seat single engine aircraft. Together they built an airplane in Daniel’s garage using a Vans RV-8 kit. Rainstar listened in awe to Daniels aviation stories as he spent his weekends and holidays working on the project. Daniel would eventually name the plane after him in honor for his dedication to the project. Upon completion of the project, they traveled to Sun N Fun the second largest airshow in the USA to participate in the 100th anniversary of powered flight celebrations. Their feat would be chronicled in a documentary film ‘Celebration of Flight’ by Lara Juliette Sanders a German Director with Lombardo Films GMBH. The retired pilot had flown all over Europe and Africa and counted the King of Yemen and Emperor Haile Selassie of Ethiopia among his VIP passengers. “Daniel was an inspiring mentor who provided me ground school lessons on air law, weight and balance, and weather theory which would later help me in my college courses,” he noted. 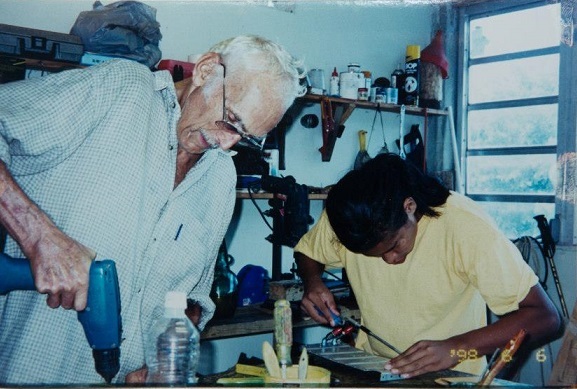 Rainstar with his mentor Daniel Rundstroem works on building the aircraft. “I learned age does not matter when it comes to accomplishing your dreams, your passion is the best motivation. I learned through our challenges we faced on our project that a positive attitude with perseverance leads to a productive outcomes,” he continued. Soon after graduating high school in 2003, Rainstar enrolled in the ‘Professional Pilot Program’ at the Aviation Institute\Broward Community College where he first soloed. He later transferred to Phoenix East Aviation to complete his private pilot’s license. 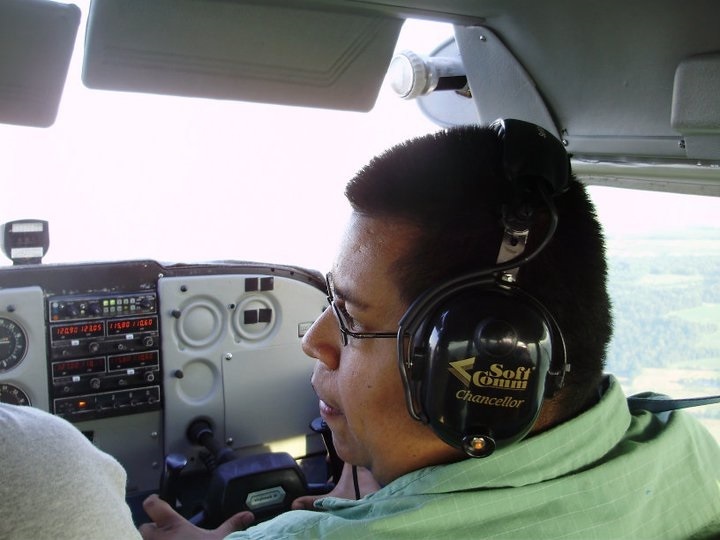 In August 2008 he enrolled at the First Nations Technical Institute in Deseronto, Ontario, Canada in the aviation fixed wing diploma program. Two years later he received his Transport Canada\US Federal Aviation Administration commercial pilot’s license and multi-engine rating. Unfortunately for Rainstar lack of funds forced him to discontinue his training, which would have allowed him to receive his ‘instrument rating’” to complete the requirements for an aviation diploma and eventual graduation. Consequently, his present license as a commercial pilot is restricted to no commercial passenger flights more than 50 nautical miles in the day and no night flights. These limitations make him uncompetitive for hire at the present time. To complete his training, and to remove the limitations on his license, Rainstar requires at least $15 000 USD. He views this as just another challenge of the many that he has had to overcome. “I started this journey and I want to finish it to show all those who previously invested in me that I can achieve my dreams. I would like to serve as an inspiration for young Kalinago women and men to become involved with aviation as a career. “My goal in life is to show that you can overcome challenges to become successful. Flying for me brings excitement and challenges, once the wheels leave the ground we are free from the bonds of earth with an amazing view. It brings a thrill and sense of happiness to me; being a pilot it is what I love most,” he notes. Rainstar plans to enroll in Cornwall Aviation by June 2014 to complete his training. In an effort to raise the requisite funds he is appealing for support from the general public and have established a crowd funding website at GoFundMe . He can also be contacted by email at rainstarluke@yahoo.com or by cellphone at 202 603 0694. The aspiring pilot is anxious to complete his training and begin to give back to his country and the many people that have helped him along the way. “My long term vision is to use my skills and talents in aviation to help my Kalinago Indian tribe and country Dominica develop in the aerospace industry. I believe there is a lot of potential to develop the aviation infrastructure and businesses,” he concluded.